How to best take care of yourself through this process. When you are thinking about divorce, what should you do? As a marriage and family therapist, I, of course, feel the need to recommend that you do your due diligence to make sure you have tried to address the problems or salvage the relationship, if possible*. This can be through communicating with each other or through the process of marriage counseling. Marriage counseling can get a bad reputation sometimes. The reason behind this is somewhat complex. You’ve got 2 different people with their own perspectives wanting to work through some level of hurt, disappointment or betrayal by the other at the same time. When you add time before they get to counseling in the mix it really can get difficult. I say that because couples wait an average of 7 years from the time the problems begin before seeking help – so although we can teach couples new ways to interact and communicate, the couple is usually fighting against a very long history of the same problems. Once you have determined that the marriage cannot be saved, get ready to hold on for the emotional ride. One day you might actually feel relief to know that you don’t have to deal with the same problems over and over again. You might be looking forward to some freedom or independence, maybe even looking forward to dating. But the next day, you may feel critically lonely or scared that no one will ever love you again. This crazy-making emotional roller coaster is what we know as grief. What’s that, you say, but no one died! You should expect to experience all the stages in some way or another. The problem with grief processing is that it doesn’t always move in a linear way through each stage. One day, you may feel that you’ve got it all handled (acceptance) but then the next, you feel all the anger you may have felt on day one. Grief can be a cruel process. I’ve heard plenty of stories demonstrating this: how it usually plays out is that your life will be moving along towards divorce, but then you meet up with your ex to work out some life details. You end up having a nice moment, maybe even sleep together. All of a sudden, you’re questioning what’s happening, feeling confused. Anger can result if the emotions are not attended to, moving you between acceptance, denial and anger – all within a day in that example. I tend to notice this pattern quite frequently when I’m working through the divorce process with clients. Keep in mind that there’s a lot of history behind every split. It’s tough to break that bond even if you are mad. Keep in mind also, that if you have kids, (even adults ones) , they too will be in their own grief process. If you have kids, I want to start this section with some information to set you mind at ease just a little bit. First and foremost, divorce does impact kids no matter what the age , just like any emotional upheaval in life, but NO it does NOT destine them for a bad life or bad relationships. 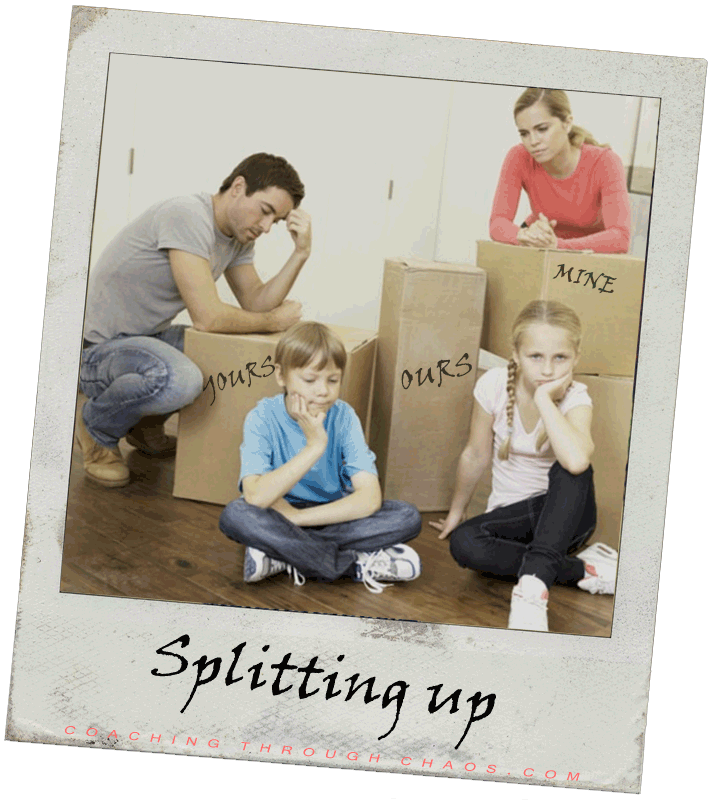 The Scientific American offers a summary of studies on children and divorce demonstrating that on average there are only very small differences between children of divorced parents and those from intact families. Over time, children of divorce are not much different in their academic achievement, self-concept, social relationships, behavior and emotional health from their peers who haven’t experienced a family split. Research shows that most children of divorce become well-adjusted adults. Tell the age-appropriate truth. Your kids are entitled to know why you are getting a divorce, but long-winded reasons may only confuse them. Pick something simple and honest, like “We can’t get along anymore.” You’ll use age-appropriate language. It’s so important that even if you think they’re not going to like an answer, that you don’t sugar coat things. Meaning don’t say “oh, nothings really going to change, Daddy travels all the time anyway” when, truly, most aspects of their life are changing. Say “I love you.” Letting your children know that your love for them hasn’t changed is a powerful message. They need to know that your love isn’t gone for them even if it is for their other parent. If this is not in your vernacular, please make an effort to get in the habit of saying it. Kids needs words. They don’t like to have to guess. Discuss the changes they can expect to experience. Try to preempt your kids’ questions about changes in their lives by acknowledging that some things will be different now, and others won’t. For instance, if you know they will be going to the same school, or where they will be living, tell them that. Let them know that together you can deal with each detail as you go. Try to let them know about the changes before they have to ask. Avoid blaming. Be respectful of your spouse when giving the reasons for the separation. It’s important to be honest with your kids, but it’s vital to not be critical of your children’s other parent. Telling them together as a unified front is ideal. Try to be organized in what you are going to say and in agreement with your spouse about what details you will share. If you are unable to tell them at the same time, please try to make sure they hear it from you first, before they hear you talking about it with anyone else. This means to avoid phone conversations about it when your child is home. Kids have a tendency to feel tension between their parents. They are likely to try to listen for whatever information they can get when they feel something is wrong between their parents. Now that they know, how will they react? Young kids tend to regress a little bit and demonstrate more dependent behavior and teenagers tend to show more independence and sometimes appear more angry. Essentially, your younger children may appear to regress and become less mature (emotional outbursts, emotionally clingy behavior may appear), and the older kids may appear more emotionally disengaged. Just stay mindful of the grieving process. You are all experiencing it and it shows itself in different ways. Try not to engage in arguments about why you are or why you shouldn’t divorce. Don’t try to justify your decision. I’ve never met a kid who reflected back and said, “I totally understood it when my Mom explained it to me”. Yes, they eventually can get there, but in the moment, or in the early stages of the separation, they can get stuck on the idea that they don’t want the divorce to happen. Let them talk about it and acknowledge their feelings. Your adult kids will also have opinions and emotions about it. Most often, their upset comes in thinking about how their family is now broken – they can get curious about how they are going to be expected to divide their time. They may get resentful. I can’t stress this enough, even though your child may be an adult, they are still your CHILD. I have learned to advise my clients to think of their adult child as their 13 year-old version when deciding how much to share with them. Inevitably, parents think because the kid is an adult, they should get more information. That is not necessarily recommended. Most often, you child won’t want to get put in between you and their other parent. The 13 year-old guideline gives you a good perspective of just how much you may need to pull back what you thought you were going to share. What can you do to help your kids adjust ? Listen to them. Encourage your child to share their feelings and really listen to them. Help them express their feelings. Children often have difficulty expressing their feelings. You can help by noticing their moods and encouraging them to talk. Let them be honest. Children might resist sharing their true feelings for fear of hurting you. It may not always be what you want to hear, but let them know that whatever they say is okay. Acknowledge. You may not be able to fix their problems or change their sadness to happiness, but you can show that you understand. The Children’s Bill of Rights is not a legal document. It’s a list of “rights” you child is entitled to through the divorce. It may cover things like: “I have the right to not have to listen to bad words said about my other parent”. or “I have the right to not be put in the middle of my parents divorce”. There are several examples online if you Google “children’s bill of rights divorce”. You’ll find all sorts of options, some are elaborate & some are simple. The point of this is that your kids have a right to know that their relationships with their parents are not changing and that their life will go on peacefully. Your mediator, parenting coach or attorney can advise you as to the standards for parenting plans. The basic goals of a parenting plans are to help you provide a set structure, emotional boundaries, consistency & predictability for your kids. The parenting plan details the terms of visitation – when does the child go to each parent, pick up and drop off times, how are holidays scheduled, etc. If that is in place early on and followed consistently, both your child(ren) and you will have a better chance of adjusting more easily to the “new normal” because there is predictability your life. I recommend getting your plan formalized in writing ASAP – My experience working with couples through a separation/divorce is that everything goes well, until it doesn’t and by that time, it usually goes very bad quickly. Getting back to you – Why should you educate yourself about this process? Simply put, knowledge is power. When you get information and educate yourself, it demystifies the process. Some of you are reading this post after attending the Second Saturday workshop (presented by Wife.org) where I gave this talk in San Diego. For those that are attending workshops such as this, you are already taking those steps to educate yourself. If you are reading this outside the San Diego area, you can search Wife.org to find a Second Saturday workshop in your area. You might also Google: “divorce workshop” or “divorce class” to see what turns up in your area. Ok. But why is it so important? What’s the benefits of giving up a half a day to sit in a workshop to hear about how to get divorced when you might already have an attorney or a mediator helping you? a. Manage your emotions – if you are educated in the process, you can make logical decision, verses ones borne out of anxiety, upset or fear. b. Learn to disengage from the marital relationship and engage in your new role in relation to your soon-to-be ex-spouse. If you have kids, your new role is as “co-parent”. If you don’t have kids, you still may have close family and friend ties and if you are able to disengage from your position as “hurt/angry/disappointed spouse”, you can more objectively work through your other close relationships to figure out how you will both stay friends (or in contact with family members) as you wish to even without the marital tie to each other. Essentially, you can move into your “former spouse” or “post-spouse” role more easily if you are not cluttered with a lot of negative emotions. (I’m not trying to say you are not supposed to feel your negative emotions, but we want to get to a point where they don’t cloud our judgment in relationship decisions). Most Important – Take Care of YOU! Understand yourself before moving into the next relationship. Now’s a great time to see out therapy to really explore and understand why this relationship didn’t work out so you can move into a place of awareness in the future. It’s a great time to understand what you are attracted to, why you attracted to certain attributes, and what’s in your best interest. Support Groups can be great for emotionally managing yourself through a divorce. It can really be helpful to connect with others who have truly felt what you are feeling and have survived. Support groups also give you a set of people to talk with about your divorce. Often, people will start to over-depend on their friends to answer their calls or come over and “bet there” for them at all days and times. This can put an unhealthy strain on your friendships, and quite frankly, it can damage them if you call on friends you shared with your estranged spouse. Friendships can get strained when we expect our friends to be there for us “no matter what”. We can often neglect to ask our friends about their lives, getting so consumed with our own troubles. No one wants to be put in the middle, including your friends. Look around, see what’s available as far as divorce support groups, you might be surprised. You should be able to find groups that are set up for peer support, for social support and for both. This is a great time for making new connections, and those groups can be a great place to start. Keep your social media disclosures to a minimum. I heard recently that Facebook is cited in about 80% of divorces today. That’s a lot of complaining about social media posting in the courts! You might be excited to show off that you are getting through your divorce: “Hey! Look at me – I didn’t need her!” “Hey! Check out my new man! Who needs ’em!” We’ll, those kinds of postings can come back to haunt you by way of complaints like: “Just look at his/her Facebook page- they’re always out partying! She’s never spending any time with the kids!” I know, that’s not what you intend to be showing off when you post those things, but it’s all about perception. While the divorce is pending, focus on your needs, your kid’s needs and moving forward without the need for publishing it. You can share all you want after it’s final. Try not to date before the divorce is finalized. Quite frankly, most people don’t follow this. I say it, not because I think it will come back to haunt you by way of complaints and accusations in court. I say it because I think you need time to really mourn the loss of the marital life (even it it wasn’t a good one) and understand who you are now and design the life you want to live. If people move into dating relationships too soon, they are likely to focus on the new relationship and those needs, verses the ones I just cited. Make a plan for your future – Once you’ve got a good handle on what your present situation is, you’re getting help to understand it, the grief is starting to subside. Find things to look forward to ! Will you take a class? Will you go after a new job? What do you want your new life to look like? If you would like more information, please don’t hesitate to contact me – I’d be happy to help you through this transition. * When I discuss trying to work out and resolve problems before separating, I am not including situations in which there is active Domestic Violence present in the relationship. In cases of Domestic Violence, please seek out services to best help you stay safe (police, shelters, restraining orders, individual counseling). Not all problems can, or should be worked on, especially if someone’s safety is at risk.